If you are running short of vegetables, paruppu thengai poriyal (பருப்பு தேங்காய் பொரியல்) is the best way out. Just give it a try! 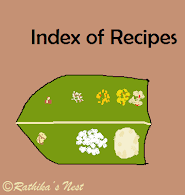 *Cabbage, carrot, broad beans, cluster beans, french beans, snake gourd, and chow-chow may be prepared in this manner. Cabbage, broad beans, cluster beans and french beans should be cut finely. Snake gourd, chow-chow and carrot should be cut into small pieces. Method: Soak moong dhal in warm water for half an hour. Heat oil in a kadai and fry red chillies till they turn darker in color. Add mustard seeds, when they start to sputter, add urad dhal and fry till the dhal turns goldern brown. Add asafoetida and switch of the fire. Add the cut vegetables, turmeric powder and salt and mix well. Drain water and add the moong dhal. Sprinkle a teablespoon of water, cover and cook on a low flame. Turn the poriyal every now and then. If the poriyal starts sticking to the kadai sprinkle some more water and continue to cook, till the vegetables and dhal are cooked well. Now add grated coconut, toss a few times and remove from fire. Garnish with curry leaves.Serve hot with rice and sambar/ kuzhambu/ rasam. Tip: You can cook the vegetables first, and then add half-cooked moong dhal or toor dhal before adding coconut. Please note that only half-cooked (அரை வேக்காடு) toor dhal should be used, as it takes much longer time to cook.